Is Kim Jong-un Preparing for War on the Korean Peninsula? The end of 2017 and the beginning of 2018 brought a whole set of news in the media, the essence of which could be reduced to the phrase ‘the DPRK is preparing for war’. First of all, this statement was made by the representative of the Ministry of Foreign Affairs of the Democratic People’s Republic of Korea, circulated by the KCNA agency on December 7. This comes down to the thesis that the statements of American politicians and field training exercises directed against the DPRK are alarming and ‘a warning that the DPRK must prepare for a war on the peninsula’. As a result ‘there is only one unanswered question: when will the war begin’. And although the Northerners rather said that American actions lead to the inevitability of a military conflict, the media presented this as ‘the DPRK is preparing for war’, and media unfriendly to Pyongyang as ‘the DPRK is going to strike first’. 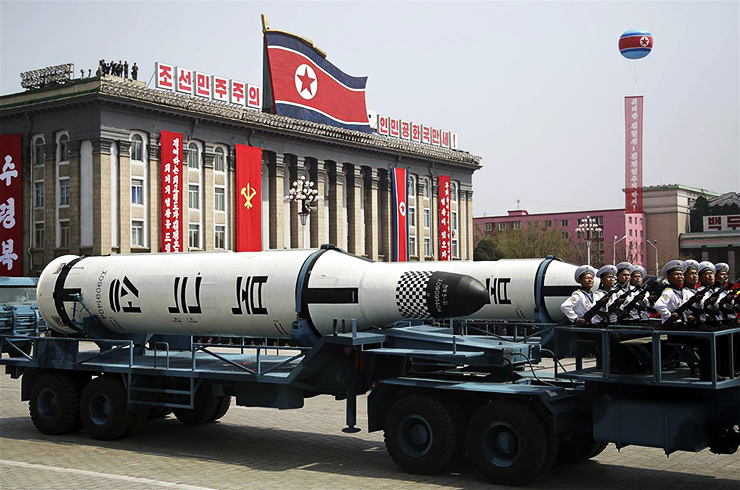 It is also known that (the Daily Telegraph reported, citing a source in the administration), the United States is developing a plan for a preemptive strike against North Korea: ‘The Pentagon is trying to find options that will allow it to pinch North Korea’s nose, get its attention and show that we are serious’, and there is an opinion that a rocket attack on the Syrian air base Shayrat in April 2017 may be considered as a model for this. In general, by the time indicated, war as an alternative had shifted from a hypothetical threat to an analytical one, and it had begun to be not simply discussed, but ‘draw straws in advance’. We have already written about the actions of the PRC but here you can include the test of the alert system in Hawaii or Japan, and the Sunday Times report that the British Defence Ministry is developing a plan for the evacuation of United Kingdom nationals from the South Korea. The probability of war on the Korean peninsula is growing and is approaching 40% Herbert McMaster, White House national security adviser recently spoke out in a similar vein saying that he believes that the probability of war is growing every day. US Senator Lindsay Graham in an interview with Atlantic magazine estimates the likelihood that US President Donald Trump will declare war on the DPRK as 30%. And according to Kyodo agency sources, the National Security Council of Japan is studying four scenarios of an outbreak of war on the peninsula, including an accidental military clash between the Armed Forces of both countries, a US preemptive strike against the DPRK, the invasion of the North Korean army into the South and a North Korean missile strike on Japan. So is Kim preparing for war? The question is crafty, for considering a war as inevitable and intending to start it first are not the same things. It is another matter that in the mass consciousness the phrase ‘X is preparing for war’ is often understood as ‘X is preparing to start a war’, and therefore the author would like to clarify a number of points. Firstly, we see that both the potential parties to the conflict and the neighbouring countries consider the likelihood of a military conflict to be high enough to begin preparing for it. However, the preparation for war is NOT identical to preparing for the initiation of war. Neither field training exercises, nor the existence of operational plans, nor even the statements of some politicians, are full confirmation of a country’s desire to start a conflict. Secondly, when they say that a politician wants a war or/and prepares for a war, it is precisely the situation when a politician chooses a war having choice – to fight or not to fight. According to the author, if the leadership of the DPRK has such a choice, Kim will not start a war. Conversations about the fact that he cherishes plans for the ‘communization of the South’ refer to propaganda fantasies. It’s another matter that if you have the opportunity to strike and have the desire to strike – a pretty strong difference, then those who look at it from a technical point of view believe that if there is an opportunity for a strike, then desire is just a matter of time, political will or circumstances. Thirdly, what from a military point of view will look like a pre-planned action, from a political point of view, may be a forced decision in the absence of a choice ‘to start or not to start’. Let us explain. From the point of view of preparing the army and economy for the war and taking into account the specific conditions of Korea, there is no difference between defence, preemptive strike, and attack. In the event of a conflict on the Korean peninsula, the one who strikes first will have decisive advantages, since the conflict with high probability will unfold not gradually, but ‘all at once, with the maximum calibre’. It is more convenient for Washington and Pyongyang to start ’with both barrels’, because Pyongyang’s goal is to immediately cut off possible channels for delivering ammunition and transferring troops, which requires attacks on ports and US bases in the region. And Washington needs to ensure that the probability of a ‘retaliatory strike’ is minimised, which requires ‘carpet bombing’. In what situation would the North make a preemptive strike? Imagine that Kim Jong-un gets information that in the very near future his opponents will begin an invasion. What can be done? It is impossible to take a first hit. ‘To play defence first’, also isn’t an option for the DPRK, since it will not be so much about an overland invasion, but about a missile strike – airborne assault or movement through the DMZ will come later, if ever comes. There is no desire for an appeal to the UN or rely on the help of the Russian Federation or the PRC, for there is an understanding that neither will help (not to mention the fact that Juche ideology requires coping on its own). The chances of winning the war are next to none; unless the option of causing unacceptable damage, which may force the United States to stop the war due to too high cost. That too, does not provide a full guarantee (the enemy can fall into Pearl Harbor effect), but this is the lesser of evils. Thus, there is only one choice: to die with disgrace or to die with courage: ‘take the company to Hell’ and strike first simply because in this case the DPRK will at least hold on longer and try to inflict more unacceptable damage on the enemy. Is it possible that in the event of a preemptive strike, the DPRK could achieve certain successes? – YES, but these successes will be tactical. The North cannot win a war of attrition, which deals with cohesion between military industries and logistics. And in response to a successful offensive on land, the United States can destroy the infrastructure of the North, descending to counter-value strategies, rather then deploying troops. And again, the instability and inability of the South Korean army in combat conditions is in fact the same speculative value as the combat characteristics of the DPRK’s army. The experience of separate encounters at sea and otherwise during the 21st century (2002, 2010, etc.) does not allow us to make an unambiguous conclusion about how this or that side will behave in a large-scale conflict. But big games are often conducted on the principle ‘I know that he knows what I know …’. Hence, although small, there is a probability that the United States through skilful combination of pressure and misinformation will bring the North Korean leadership to understanding that the war is inevitable and if so, it’s time to ‘die with the music’. From a cynical point of view, something similar is necessary for American strategists: if Kim ‘makes first move’, the war with the North will not look like unprovoked aggression or a ‘preemptive strike, but as a response to Pyongyang’s confirmed and real aggression. In this case, the DPRK will have problems with the support of Russia and China, and the possible losses of the ROK and Japan may prove quite acceptable. In general, the author tends to agree with the position of the head of the Russian Ministry of Foreign Affairs, who, commenting on the steps of the United States, openly stated that ‘everything was done specifically for Kim Jong-un to break off and take another adventurous action’. Thus, the question of the DPRK preparing for war is divided into a number of sub-questions, to which there are clear answers. Is Kim Jong-un considering war as one of the variants of the development of events? – Answer: «YES». Is he preparing for war in terms of maximizing the resources of opposition to an enemy? – Answer: «YES». Does this mean that Kim is considering a preemptive strike option? – Most likely, YES, because it is dictated by strategic considerations. Regardless of the further course of the war, the first blow provides an advantage. Does the author concede that in a certain situation, Kim Jong-un ‘will start first’? – YES, BUT for this he needs to be convinced that the conflict is inevitable and there is no other alternative. Does the author concede that in a certain situation Kim Jong-un could be forced to ‘come’ to such a conclusion (despite the fact that the real situation will differ) and actually be provoked into these actions? – YES, in a certain situation, such probability exists, although the author does not consider it very likely. Does Kim Jong-un believe that he can really defeat the United States? – Most likely, NO. Kim may believe that he will inflict unacceptable damage on the US, against which they will be forced to fold military operations. But in a classic victory over the United States and its allies, I think he does not believe. An attempt to attribute this view to him makes him look like ‘Kim Jong-un from a comic book’. Is Kim Jong-un going to start a war not because of non ‘emergency situation’, but in order to ‘communise’ the South? – NO, because, I think, he understands that aggression will deprive him of last allies and actually place him in the status of an ‘outcast’, and the attacking the ROK is equivalent to a conflict with the US.